When I was a kid, I went to my town’s Halloween parade and costume contest every year and every year I lost. I remember being so proud of my plastic Annie mask or my angel halo made out of a hanger and tin foil and being super sad when I lost. I think this losing did something to my psyche because now I have the overwhelming need to enter my kids in the exact same parade and costume contest and leave as winners. Over the years I’ve learned two sure fire ways to win: make a homemade costume, and enter as a group. 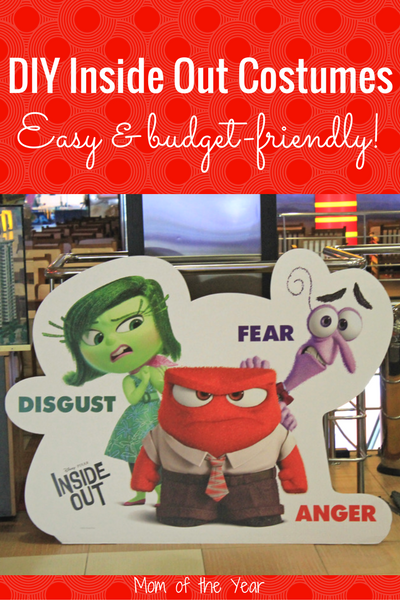 And this year, I’m sure we’re going to come in first with our nifty DIY Inside Out Halloween Costumes. 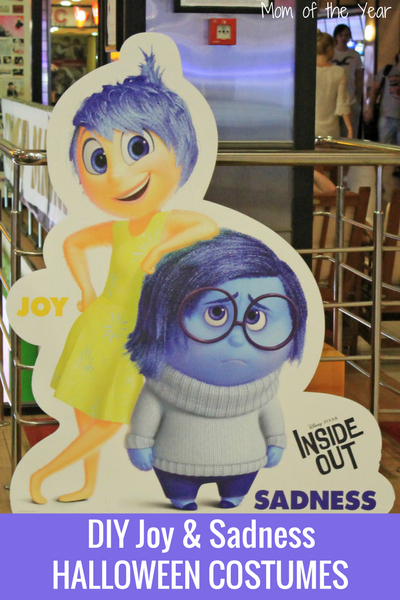 Without further ado I give you: Joy, Sadness, and Disgust from Inside Out! 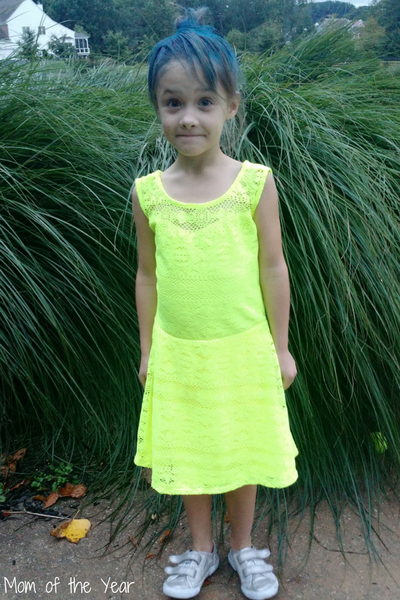 The Clothes: Joy’s outfit is pretty simple–a bright yellow dress. I found this one in the women’s section at the Goodwill. It was way too big for my Joy, but I loved the bright color so much I went ahead and bought it. It was fairly easy to take it in and hem it up a little. In the movie Joy is barefoot, but that doesn’t work for trick or treating, so my Joy will wear some sparkly sneakers we already had. The Hair: To make my daughter’s long hair appear short, I pulled her hair into a high ponytail on the very top of her head. I then folded her hair forward so that the ends of her hair were falling over her forehead like bangs, and secured it with another hairband. I wrapped a piece around the ponytail and pinned the end sticking up to mimic Joy’s cowlick at the top of her head. Then I added some blue hairspray and I had my own little pixie haired Joy! The Clothes: I found this turtleneck when I was out shopping for fall clothes for the girls and knew it would be perfect for Sadness! And it’s a cute sweater that my daughter can wear after Halloween too. We finished the look with a pair of blue leggings and some blue crocs that we already own. The perfect Sadness glasses were an easy recycle from my son’s Harry Potter costume from last Halloween. The Hair: I gave my daughter an extreme side part, then pulled her long hair back into a low, loose ponytail. I pulled the sides forward a little to make it look like she had short hair. 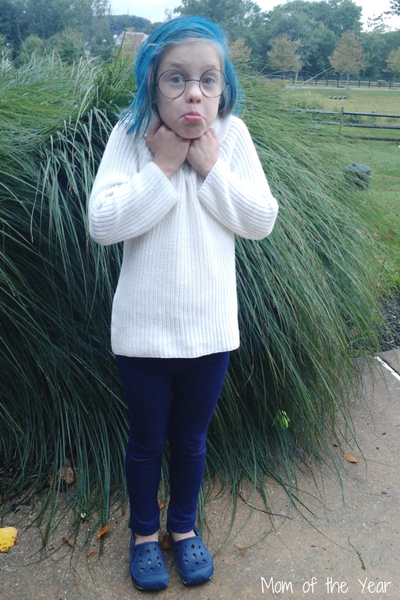 Then, we borrowed some of Joy’s blue hairspray and voila, an adorable little Sadness! 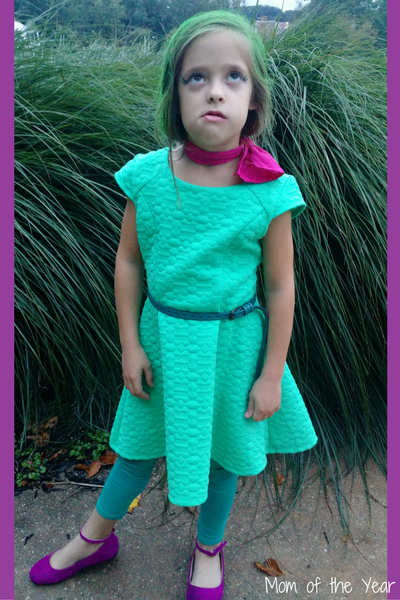 The Clothes: The most important part of Disgust’s look is her flared green dress. The one I found doesn’t look exactly like Disgust’s dress of course, but once I put the accessories with it, I’m really happy with how it came out. I found the belt and scarf at Goodwill and I splurged on new shoes because they are so perfect, plus my Disgust can wear them to church on Sundays. The Hair and Makeup: I did Disgust’s hair the same way I did Sadness’ hair, by pulling it into a low ponytail and pulling the sides out a little to make my daughter’s long hair look like a short bob. Then I sprayed her hair green. For make-up, I drew two exaggeratedly long “eyelashes” at the corners of her eyes and I let her wear a little pink lipstick. 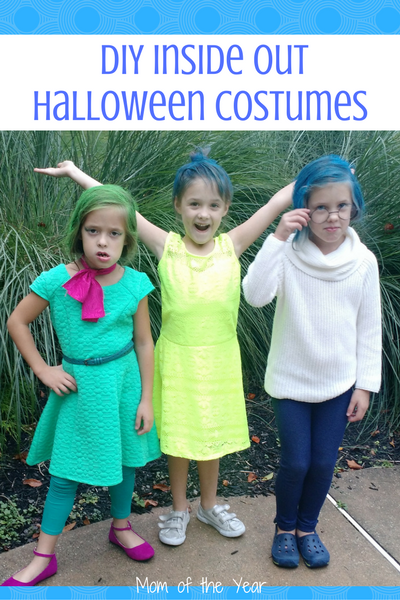 I’m pretty sure we’ll be picking up first prize for our group at the Halloween Parade this year with these DIY Inside Out Halloween costumes! Right? Too adorable to pick just one! That’s why I’m going to enter them in the Best Group Category! Amazing job well done! They are sure to win!! Their facial expressions… especially disgust… are priceless and perfect ! Thanks Jen! My Disgust has had some experience using that face!